What does a Raleigh mother in law suite floor plan look like? Privacy and comfort are just the starting point when you're designing a home with an extended guest retreat. Whether you'd prefer a simple bedroom and bath, dual master suites, some living area, or an entire apartment, your custom builder's ability to be flexible can make a huge impact. When you work with one of the nation's top builders, like Stanton Homes, you can almost design it yourself, with the help of your personal design team – a service we provide as part of your custom home package, along with lots of other “extras” including the ecoHOME energy saving advantage. We work with plans from virtually every architect, but there's something so special about mother-in-law suites that we always end up creating something different. Take the video tours by clicking on the pictures, below. Get ideas. And talk to us about what we can do, just for you. An elevator was included in this version of the Dugan. Watch a video tour of this home - click here or the photo. In this version of the Woodlake, the home owner wanted to create a distinct space for an in law suite. Another version of this home could create an even more private area with a few simple changes - by moving the closet to a different wall, opening up the family room and bedroom, and adding a door to the hallway. This would create an in law suite with private bathroom and living room. Request a flyer for this home. This version of the Greenhaven includes an in law suite with living room and master suite style bathroom. Accessible features were incorporated into this in law bathroom, including a roll under counter and roll in shower. 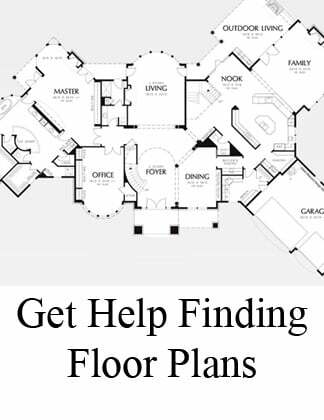 Start by bringing us a floor plan from any architect or floor plan source. Or ask us to find one for you. We’ll use our vast search resources to find floor plans you like – and then we’ll work with you to make them perfect. Stanton Homes designs most of the mother in law plans we build, because everyone’s needs are unique. These mother in law suite homes can be designed to include anything you need – such as adapted features or fully accessible design - with a second master bedroom with a private bathroom and large closet, and optional living room, kitchenette, and private entrances. 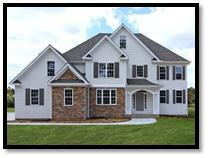 Our in-house design work comes included in our custom home packages, at no extra cost to our homebuyers. A bedroom with a full bath attached. A bedroom with a sitting room near a full bath. 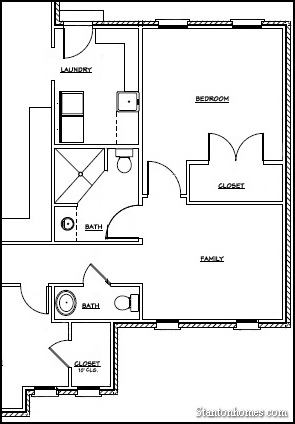 A small "apartment" which may have a bedroom and a living room/kitchenette combination. A suite with a separate entrance. But even though mother in law suite homes are becoming more popular, it can be really tough to find a floor plan that works for your family - which is why Stanton Homes often custom designs homes that offer a full mother in law suite. Sometimes a mother in law suite home can be a home with two full master suites. A second master suite gives long-term guests a large, private bath, extensive closet space, and an oversized bedroom that can usually fit not only the bedroom furniture, but also a small seating arrangement. Here are a variety of mother in law suite home floor plans. Some have private living areas, some have kitchenettes. Some offer bedrooms with a private bath. Can't find what you're looking for? 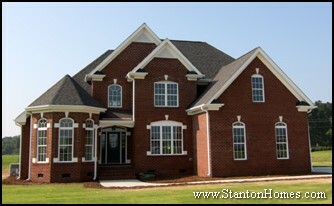 NC custom home builder Stanton Homes will help you design and build to your specific needs! Just let us know what you have in mind, and we'll schedule a design session and get your custom mother in law suite floor plan down on paper. 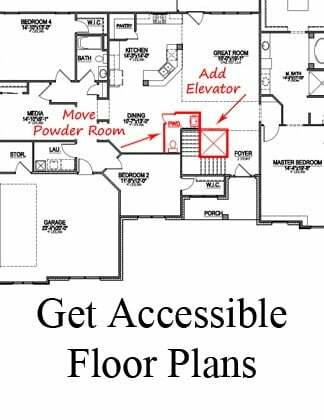 Bring us your floor plan or ask us for more ideas - we'll show you want we can do for your mother in law suite, adapted, or fully accessible home needs. What is Universal Design, and how does it make living easier? Looking for Homes with a Mother in Law Suite or Apartment? 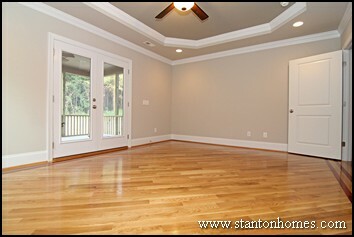 Stanton Homes is now offering a new series of floor plans with a Mother in Law Suite added. Homes with Mother in Law Suite Floor Plans have been growing in popularity, particularly among custom home buyers who are looking for something unique that can accomodate an extended family. Adding a full mother in law suite or apartment is a great way for multi-generational families to be comfortable – and a second suite can add value to your investment. A mother in law suite floor plan offers a second master bedroom, with a private bathroom and large closet, and optional living room or kitchenette. A separate entrance for the mother in law suite is also available. 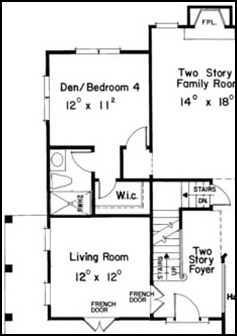 Here are two examples of the Mother in Law Suite Floor Plans Stanton Homes is now offering. Or ask how we can design and build just what you have in mind! Are 3+ Baths Still Requested in New Homes? *All floorplans and images copyright Frank Betz, Stanton Homes, or others as applicable. 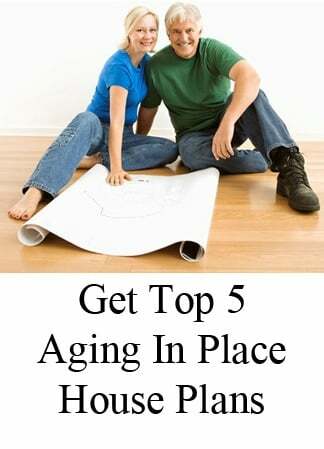 Top 5 Mother In Law Floor Plan Questions - Don't Forget to Ask! New homes with mother in law suites are more popular than ever, as the economy shifts to a more condensed lifestyle. According to a Coldwell Banker survey, financial reasons came up as the top answer homebuyers gave for wanting their new home to have a mother-in-law suite. Another big segment of homebuyers said that they wanted a home with an inlaw suite so that they would be able to take care of a family member in frail health. 1. Is a Kitchenette Necessary? If you have plenty of room in the budget, a kitchenette can be a great feature, and help keep the mother in law suite completely separate from the rest of the home. But if you're trying to keep below a certain price point, this feature can be the easiest to pass on. 2. Do you need a Second Entrance? A second entrance can be a bonus for privacy, and for potential future conversion to a separate apartment. But it might not be essential. A typical French door can add $600 or so to the cost, plus the cost of any ramps, steps, or exterior lighting. 3. How Big Should the Bathroom Be? A mother in law suite can share a bath with the rest of the home (eliminating the need for a powder room) to save cost, or can have a completely separate bath. This bathroom can have a tub, a shower only, or be a "second master bath" with both tub and shower. 4. Should the Mother in Law Suite be Accessible? There are several factors to consider. For resale, having at least an accessible guest suite can be a big plus - make sure the front entrance is easy to use, too. Consider different levels of accessibility, too. Do you need a bath with 5x5 turning radius, dismount space, and a roll in shower, or will just having a shower instead of a tub be enough? 5. Is Separate Living Space a Must? A mother in law suite can consist of anything from a large bedroom with an attached bath to a full separate living area, with private sitting room, bedroom with oversized closet, and more. Discuss your needs with your builder. 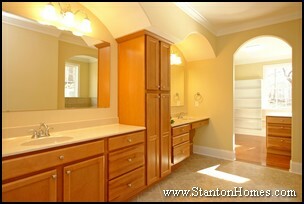 Stanton Homes specializes in unique design/build situations for homes in the $200s-$500s. 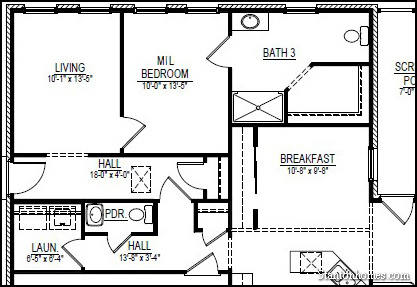 We'll work with you to create a mother in law suite floorplan that's perfect for your situation AND your budget. 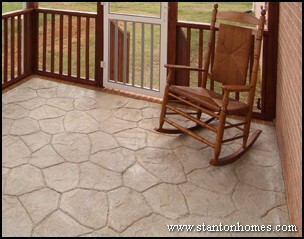 Click above for some great ideas, and sample mother in law suite floor plans. 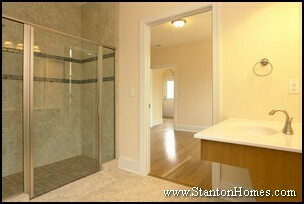 Or just ask us, and Stanton Homes will send you additional mother in law suite floor plan ideas! 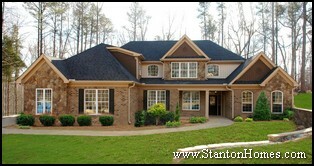 Stanton Homes builds custom homes on your lot throughout the greater Raleigh/Triangle area. Homes with inlaw suites are more popular than ever, as the economy shifts to a more condensed lifestyle. According to a Coldwell Banker survey, financial reasons came up as the top answer homebuyers gave for wanting their new home to have a mother-in-law suite. NC custom home builders are seeing additional reasons for mother in law suite floor plans, such as needing a private area for an adult child who has moved back home, or a friend who needs a place to stay for a while. New homes with mother-in-law suites also offer flexibility for overnight guests, when that space is not otherwise occupied. 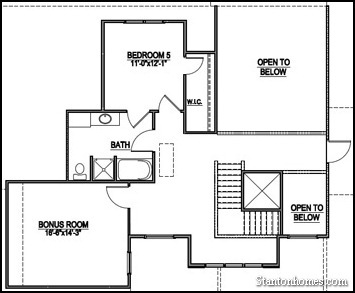 Mother-in-law suite floor plans can be as versatile as your needs. 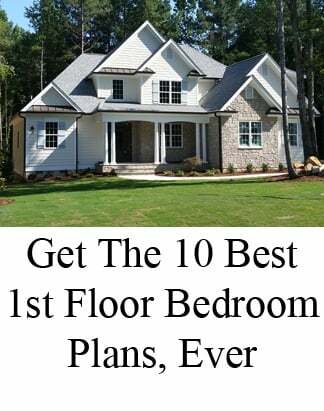 The most common homes with inlaw suites that NC custom home builders are seeing is a first floor bedroom with attached bath and sitting room, or an even more economical first floor bedroom with attached bath. - Should it include a sitting room? - Is a kitchenette worth the extra expense? - Is a private entrance to the mother-in-law suite necessary? - Will you need a larger garage? - What amenities will lead to greater resale value? 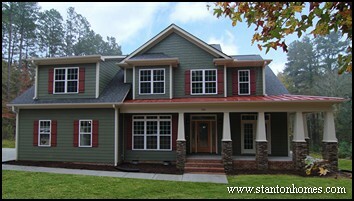 NC custom home builders like Stanton Homes design/build mother-in-law suite floor plans that are functional, practical and specific to your needs. Contact us for more information about how to build your own new home with a mother-in-law suite.